My first dive with Captain Slate was over 30 years ago on February 4, 1982 when Atlantis Dive Center was still using the well-known A-frame building as its main shop at the entrance to Key Largo. The main shop is now a short drive south of the A-frame. Starting in 1978, Atlantis Dive Center is the oldest dive shop in Key Largo. That first dive with Captain Slate was one of his early "Creature Feature" dives at the City of Washington wreck. 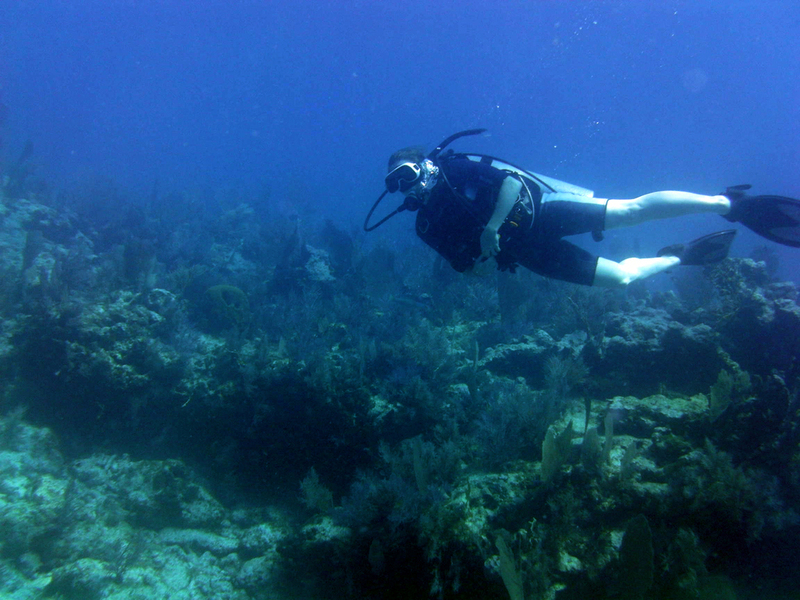 He escorted us to a spot on the nearby coral reef, where he tapped on the reef a few times. Then he pulled a fish out of a bag and put it in his mouth. A huge moray eel came out of the reef and bit the fish right out of his mouth. Sixteen years later I returned with my two sons on July 23, 1998. Captain Slate was not on that dive but we had an enjoyable experience in this beautiful underwater state park. Well, it was enjoyable until I got us lost and we came up a long way from the boat in six foot seas. Struggling against wind and current we wore ourselves out trying to get back to the boat until the boat's mate finally threw us a long rope. Then getting into the boat as its back end rose up and down several feet provided an additional "point of experience" for the three of us. 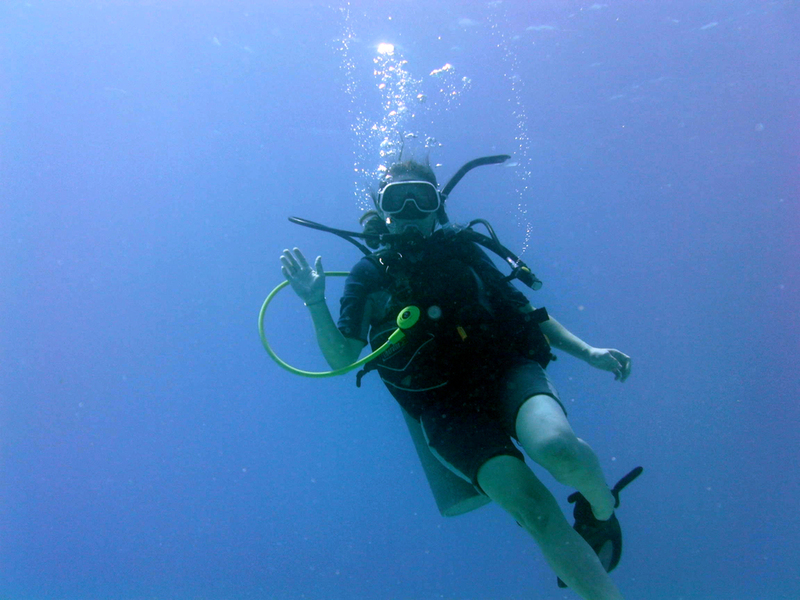 I am certainly glad that our next experience this year was a gentle, perfect set of dives. 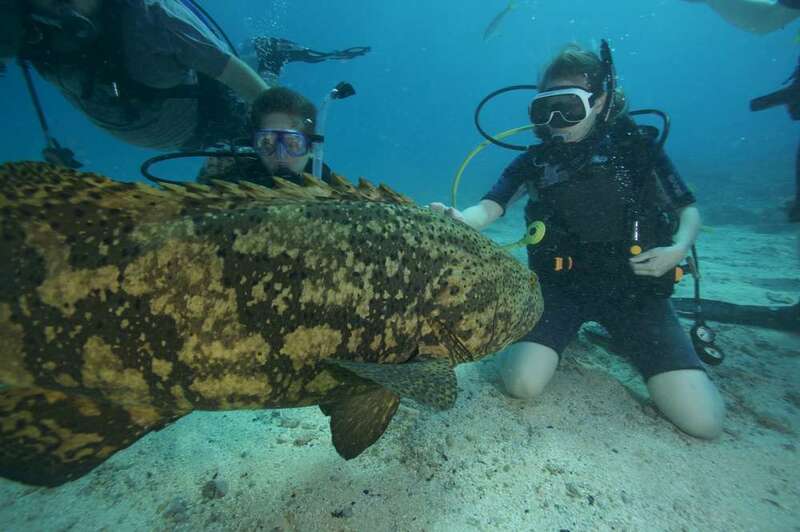 This dive was on April 13, 2012, accompanied by my oldest son and second daughter. To my delight, Captain Slate was with us again. The seas were calm, the day was perfect. Our first dive of the day was the Creature Feature, again at the City of Washington wreck. 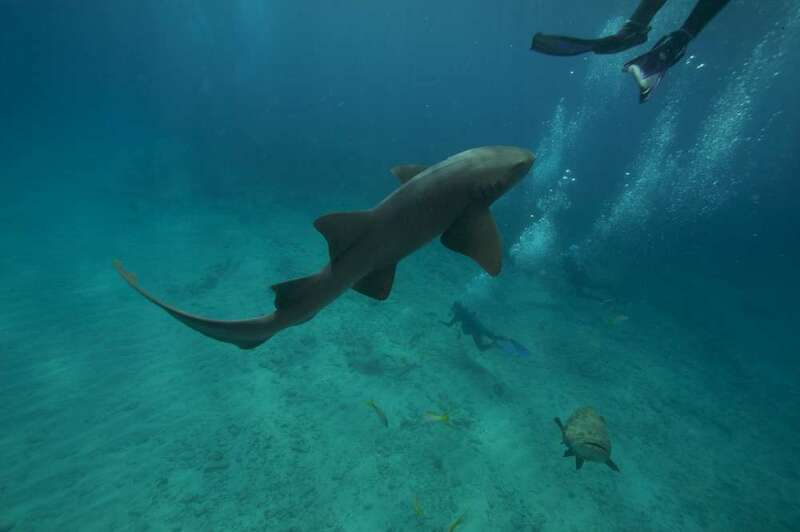 The mate chummed the waters with blood and guts to attract big nurse sharks in the area along with a number of other sea creatures. This time the "feature" took place in an open area of the ocean floor. Captain Slate had a bag of baby swordfish that he used as feeding rewards for the "creatures" part of the feature. 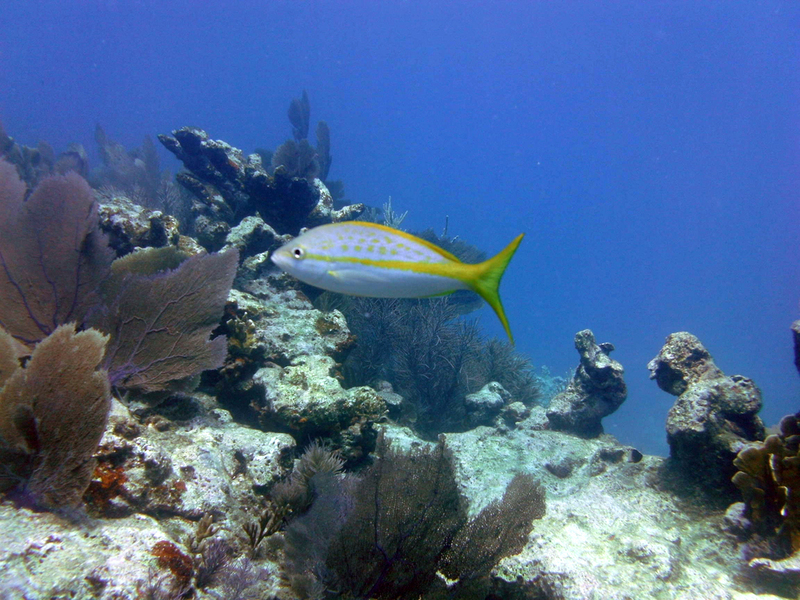 We were surrounded by huge grouper, nurse sharks and a host of other smaller fish. 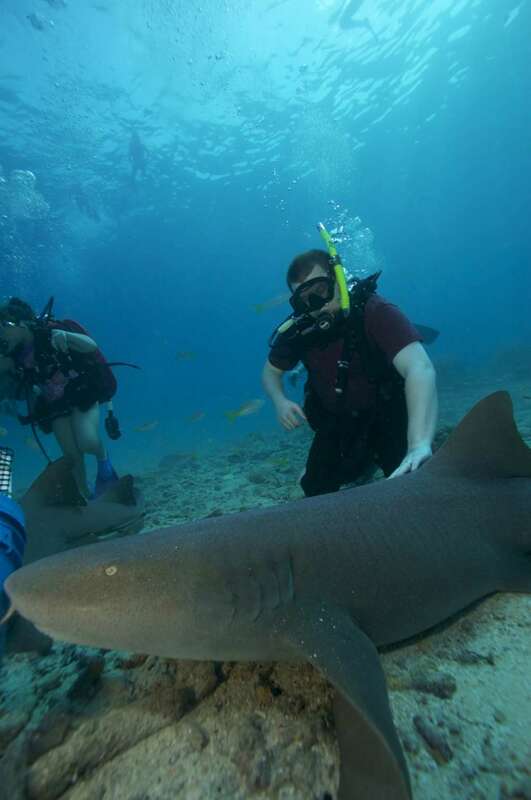 Everyone got a photo opportunity hugging a shark and petting the passing marine life. 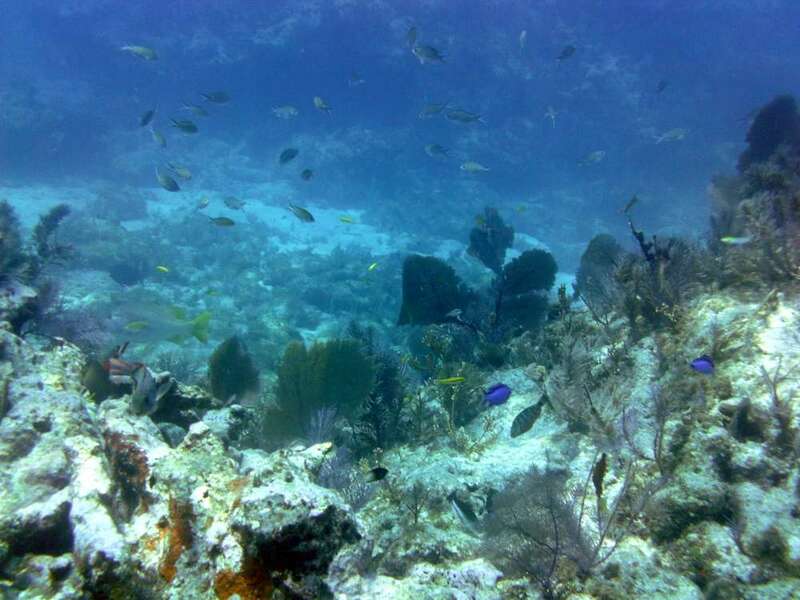 Then my daughter and son and I went off to explore the wreck and to swim around the coral reef taking pictures and videos. I love those magical moments when it feels like I am flying as I navigate between the coral "canyons". Such great fun. Our second dive was at Mike's Wreck. Then a peaceful ride back to the center. What a great day, multiplied by getting to spend it with family, reliving memories of decades gone by. We came in the day before, preceding a cruise on Oasis of the Seas with this experience in the Keys. 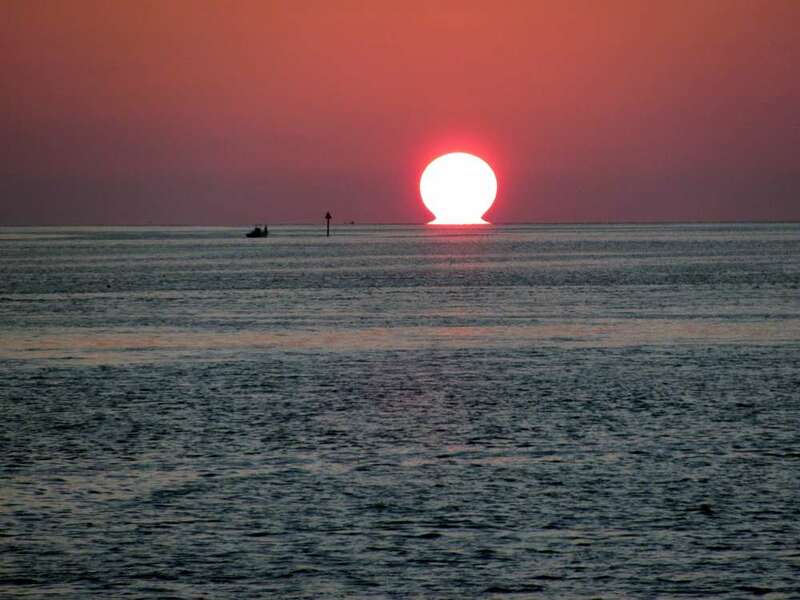 We stayed at Ocean Pointe Suites in Tavernier Key. Don't go there (see my brief article about our stay there). However, the day before our diving adventure we decided to explore some distance down the Keys. We drove an hour or so looking for a place where we could watch the sun set on the ocean. There are so many small isles just off shore that this turned out to be a challenge. We finally located a nice spot at the foot of a long bridge with good parking. With some time still available, we headed off to find something to eat. The restaurants were far and few between. Those we came across were crowded. Finally... would the Florida Keys be a place where you would expect to find great pizza? We discovered a small family-owned hole-in-the-wall place, Tower of Pizza, MM 81.5 in Islamorada. We ordered pizza, buffalo wings, and key lime pie, then returned to our sunset observation point for a picnic. The food was terrific. An unexpected gem of a find. And we got our incredible sunset!